GET ON BOARD WITH THE BAMBOO BOAT BAND... "Island Party" is the Hot new release by "The Bamboo Boat Band" and it includes your all time party favorites: *Jump in the Line (Shake Shake Senora) *Margaritaville *Brown Eyed Girl *Red Red Wine *All Aboard *Jammin *Day-O (The Bananna Boat Song) *Fun Fun Fun *Beach Party *Jamaica Farewell. The Bamboo Boat Band Specializes in Caribbean Rock and Roll, Calypso, Soca, Reggae, Steel Drums, Beach Party music and Jimmy Buffet. 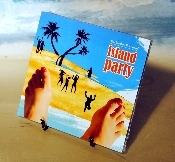 This CD is guaranteed to bring the Island vibe to your party or event. The Bamboo Boat Band is the premier choice for corporate events, festivals, concerts and private functions in the USA and worldwide. This CD is brand new and shrink-wrapped. International orders - please contact us for shipping costs. A great gift for any music lover! Buy it today!